Rachel and Richards monthly prayer group met at Rebecca and Marks yesterday. Ten of us attended. Richard played Piano and we prayed about many people who are associated with the church but are secular members or neighbours, or have certain needs. Our youngest friend played and read about Meccano and Desperate Dan. December 8th to 14th Include in prayers for this week, Jammy Church (the craft and fun day), and in particular for (i) Jacquey, who will be leading the praise and children’s address; (ii) that the cooking goes well, and whatever the numbers, that there will be an abundance of food; and finally an “ask” for a good turn out from our “regulars”, as well as some new faces. December 15th to 22nd In this week please include prayers for the Christmas Carol Service, in particular that no illness affects the choir, and musicians; and that the congregation will bring friends and family to the service. 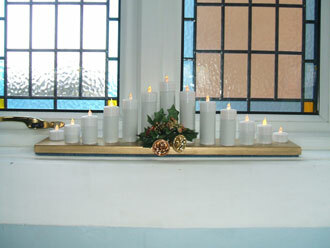 We completed the last week of the advent course yesterday. Twelve of us attended. May we take the opportunity to thank Geoffrey for his efforts and to Pam for hosting us. Many people think that church members are indoctrinated into a single fixed doctrine of belief. The thoughts and ideas expessed here clearly exposed a wide range of interpretation and belief. We will be reconvening to start a five week session course between February and April to which you are welcome. Please speak to Geoffrey for more information. 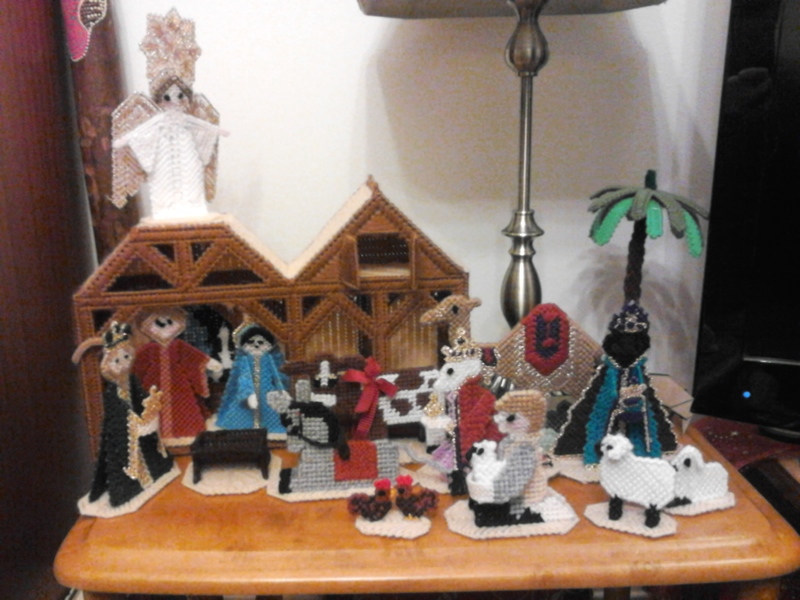 Pam’s mum made this knitted nativity scene. In association with our Weekly and Monthly Prayer Groups, Richard and Rachel have instigated a Prayer Board right next to the Tea and Coffee hatch. Everyone is welcome to contribute to its contents or ask for prayers in the continuing book of prayer requests in the front lobby. Please have a look at the Prayer Board contents as you walk past, perhaps to inspire you in your own prayers. There will be a service at 9.30 on Wednesday 25th December. The short service will be conducted by our Minister Rev. Christine Coram. 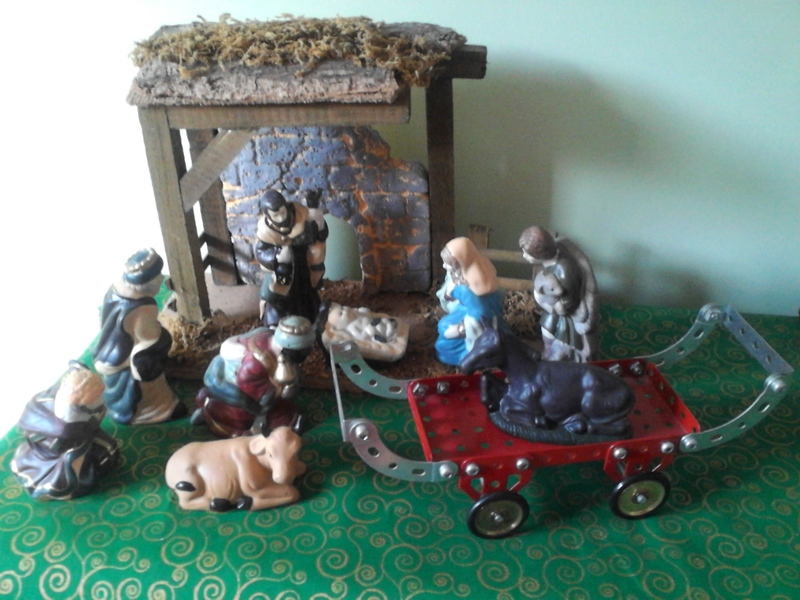 We celebrate the coming of the Christ Child, lightheartedly and with Joy on this special day. This will take place at 11.30 P.M. on Tuesday 24th December. The Service will be conducted by the Rev. Les Judd and will include Communion. We had a 70th birthday celebratory lunch for Colin and Dave, and a 50th birthday tea party for Diane. Our thanks to all the caterers especially Margaret who is stepping down as Catering organiser. The Italian evening turned out to be a great event and £400 was raised. This has paid for a lady to attend leadership training in Rome from one of our partnership churches in Europe. Thank you everybody who distributed the Christmas leaflets to the houses in the neighbourhood. We hope to encourage new friends and families to share in Christmas spirit. 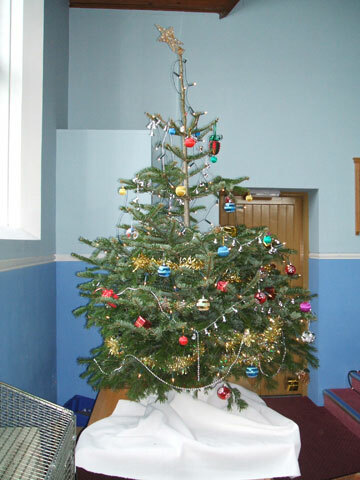 This will take place in the Church on Sunday 22nd December at 4. p.m. and will include Bible Readings and Carols interlaced in the traditional Manner. The service will be led by the Rev. Geoffrey Scarlett and the Church Choir. On rememberance sunday (10th November) members of uniformed organisations paraded past the church on the way to the Service held at the Hedge End Cenotaph. We were pleased to be able to serve hot drinks to many of them on their return trip. The tea, coffee and hot chocolate was appreciated by them on a chilly day. Our thanks to all the members of the church who were involved in any way in making this initiative possible.